Metro: A bit of a hike from Colosseo, or take Bus 40 or 64 and get off at Largo di Torre Argentina, then walk 2 blocks south. 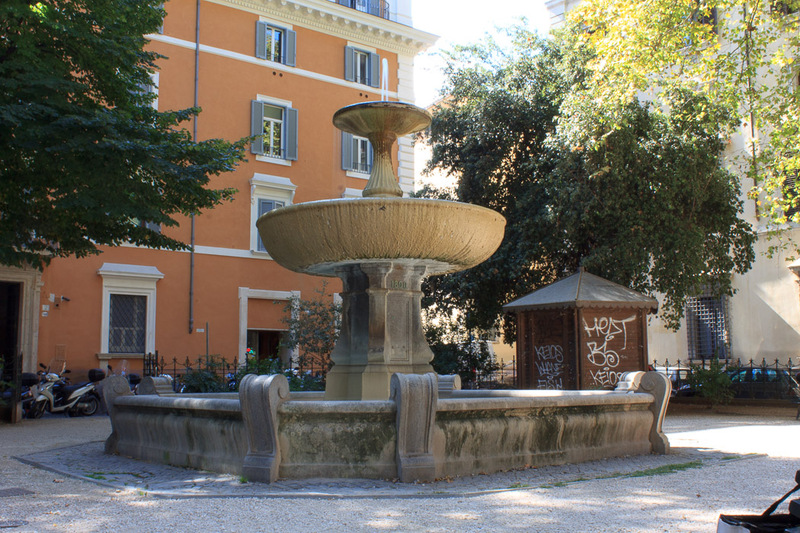 The fountain in Piazza Benedetto Cairoli is a rather plain fountain built in 1890 in a small treed park where lots of children (from a nearby school?) play. It has two plain bowls, a smaller one on top of a larger one, each on a rather plain pillar, which empty into an octagonal basin which alternates long sides with short sides. The bottom pillar apparently used to have bronze dolphins mounted to it, but they were stolen. See all Fountain in Piazza Benedetto Cairoli photos.